In my ebook, “Cards: Beautifully Handmade”, I share several ideas for making what I call “shapely” cards. The possibilities are so many: an egg-shaped card for Easter, a pumpkin shape at Halloween. You can even make cards shaped like words. You can draw and cut out whatever you can imagine — the key thing to do is to leave one portion (preferably 2” or more in length) of the original card base intact AT THE FOLD. The folded portion can be at the side or top, whichever you prefer. 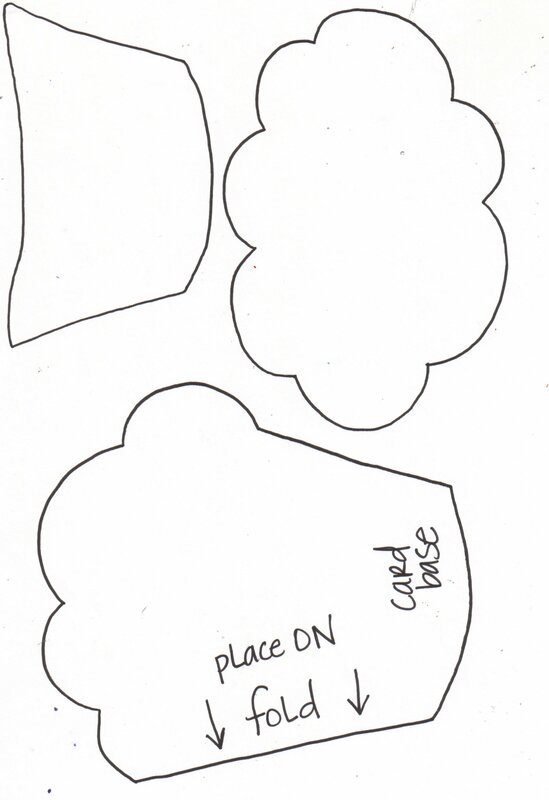 Here I’d like to share a template and step-by-step how-to for making a card shaped like a cupcake. Using textured paper for the frosting and a paper-crimper for the cupcake liner are touches that make this irresistible. 1. Print templates. Transfer to heavier material (i.e. cardstock or chipboard) and label for future use. 2. Cut kraft colored cardstock to 6” x 12” and fold in half. 3. Lay cupcake base template against the fold where noted and trace onto card base. Cut out leaving the fold intact. 4. Trace cupcake liner onto brown or kraft cardstock, and cupcake icing template onto textured paper. 5. Add texture to cupcake liner (kraft cardstock) using a paper-crimping tool. 6. Embellish cupcake icing with brads or buttons. I like to use a variety of sizes of brads and then adhere a red button to the top to look like a cherry. 7. Adhere liner piece to card front, then adhere the icing piece. 8. Sometimes if you don’t have exact placement or you don’t cut exactly on the lines, your pieces might be slightly smaller than the card base. In this case just trim excess edges that show. 9. Add Party sticker or hand-letter or use alpha stamps. 10. Embellish inside of card as desired. Tania Willis lives in Columbus, OH with her husband and adorable little girls. She loves bringing texture, dimension and lots of layers into her scrapbook pages and will rarely call a page complete unless it has just a touch of handmade added into the mix. She’s been teaching and writing in some form or another for the past 8 years. You can find out more about Tania and her classes on her blog. I LOVE THIS! I’ve been looking everywhere for something like this! Where did you buy the textured paper from? Hi, I want to make these cards for mothers day with the children in my class, as they would love them. However, when I click on templates it says ‘the page is not available’. Could you please send me a template? Hi, Sarah, My apologies and thanks for the heads-up. The templates are there now. Thx. I’ve just downloaded the template. I’ll make a birthdaycard for a partner at work. I’ll show it when it’s ready..